(Select Event Type) Birthday Party Please select Event Type. This will load the calendar with available dates and times. Travel back in time to the world of castles and knights. The Wise Wizard will guide you into the multi-level environment of fog, lights and sounds. From the moment you venture inside, your adrenaline rushes as you navigate through the black light illuminated terrain, tagging your opponents while dodging their fire. Play as a team to defend the castle. Whatever the adventure, the experience will surely bring fun and excitement. So please come and join us to Storm the Castle! Gear up for the action at your Castle Laser Tag birthday party as our party staff assists you and your guests. Your party leader will guide you and your guests through two excitement-filled laser tag games. We take care of set-up, clean-up, and everything in between so you can use your time to enjoy the party. The Castle can accommodate groups both big and small for any occasion. Commemorate a job well done with an End-of-the-Year Celebration. Honor athletic achievement with an Awards Night. Organize a meeting place for Boy/Girl Scouts. Gather neighborhood friends and family for a school or church Family Fun Night. Bring the relatives together for a Family Reunion. Or simply grab your friends and come out to just play some games. The Castle is the perfect place for any corporate occasion. Whether your focus is team-building or just to reward your hard working employees, The Castle is your spot to host both a fun and successful event. We can customize a food and beverage menu for your event. *Time is added at the end of the event after laser tag games have been completed. Additional table time is non-refundable. Events are available by reservation only. All players must be at least 7 years of age. Groups will typically play laser tag games with other parties and public players, unless event is reserved as private. A non-refundable deposit is required to hold your spot. You will be charged the entire cost of the event if you cancel within 14 days of the event. For events during regular business hours the party package includes 2 hours at a private table, 2 Laser Tag games, paper products, candles, utensils, soda for the players, tools for serving the cake, and a party leader. Birthday events during regular business hours also include a t-shirt for the guest of honor and invitations. For private events the party package includes private party tables and lobby area, unlimited laser tag games, paper products, candles, utensils, tools for serving the cake, and a party leader. How many players are included in the Party? Birthday events require 8 minimum, including the party guest of honor. Group events require 12 minimum, including the host. You can have up to 30 guests with an additional charge per player this total includes playing adults, playing siblings and the party guest of honor. Parties are available during regular business hours. Private parties or parties during non-business hours are available upon request. CLT Parties are 2 hours long. Our parties start on time and end on time. We cannot extend time due to late arrivals. What if I want to add more laser tag Games? Additional games can be added at an additional cost. Please email with your request to parties@castlelasertag.com or call 301-352-8413. How old to you have to be to play laser tag? We recommend that all players be between the ages of 7 and 107 years old to play laser tag. What does the party leader do? CLT events include 1 leader who leads your party from start to finish. They engage the group in gearing up for the laser tag games and serve refreshments. While 1 party leader is ample for your party, an additional leader can be requested at an additional cost. The party host supplies the cake. We require that the cake be store bought. We supply the candles, plates, forks and knife to cut the cake. Can I add pizza to my Party? What is the cost? Pizza can be added to all event packages. $12.50 for each Large Cheese Pizza. $13.50 for each Large Pepperoni Pizza. Please let our party coordinator know during your confirmation phone call if you would like to include pizza with your event package. What if I want to bring my own food or order my own pizza? Castle Laser Tag does not allow any food or beverage to be brought into the building besides cake and ice cream. Goodie Cups are similar to goodie bags. They include age appropriate toys, candy, a glow stick, and a crazy straw in a Castle Laser Tag novelty cup that changes color when filled with your favorite beverage. When do I need to confirm the number of children attending my party? Can I have Balloons? Pinata? Decorations? Our Building and Party areas are bright and busy. Paper products are birthday themed. Balloons can be added at an additional cost. We cannot accommodate piñatas, confetti or silly string. What if my guests have Special Needs? We welcome all guests with special needs. We ask the parents of special needs children to stay during the party. Please let us know if any of your guests have special needs during your confirmation phone call. When should we arrive for the party? Where should we place our things? Please arrive no more than 10 minutes before the start of your party. Our party coordinators will have your party space ready for you at that time. There will be a designated party area for your party guests' presents and coats. Please wait for the staff members to take the guests to your party area. With the exception of private events, your event will typically play with other parties and public players. What if I want to mail invitations to my guests? Invitations to mail to your guests can be sent to you upon your request. When you book your party on-line you have an option to request paper invitations to be mailed to your home. 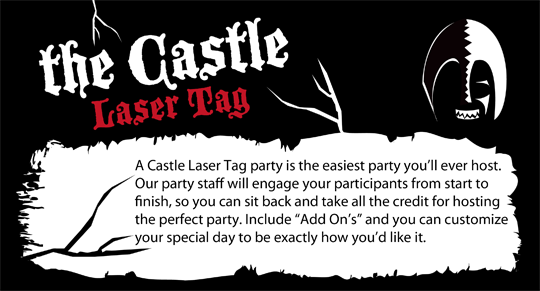 If you did not make this request at the time of booking or you want to send both the email and paper invitations please contact us parties@castlelasertag.com or call 301-352-8413. Allow 5 business days for your request to be processed and placed in the mail. How do I access the email invitations? If you booked your birthday party (group events do not include invitations) on-line then you will be able to access invitations to email at any time. Log into your "Account Management" page, scroll to the bottom of the page and click on "Create Invitations". If you booked your party in person or over the phone then email invitations are not an option. Please contact us if you need additional paper invitations parties@castlelasertag.com or call 301-352-8413. What if my guests forget the waiver? It is best to have your guests bring the waiver with them; your guests cannot enter the laser tag arena until the waiver is complete. We have waivers available at the location and can be filled out by the player or a parent/ guardian (if under the age of 18). What if there are 2 birthday guests of honor? A Castle Party is just as much fun for two as it is for one guest of honor. All of the party details are the same; 8 minimum players, 1 party leader and 2 hours of party time. However, there is $10.95 charge for an additional t-shirt. We ask that you email parties@castlelasertag.com with the date/time of the party, name of each party guest of honor, each responsible adult and phone number. We ask that one parent be responsible for the payment at the end of the party. A $100 non-refundable deposit is required to finalize your reservation. Any date change must be requested at least 24 hours prior to your party date in order for your deposit to transfer to the new date or time. There will be a $35 switch fee added to your bill in addition to all party costs. Prices effective 10/1/2010. Payment of the balance is due at the conclusion of the party and is accepted in the form of cash or credit card (Visa, MasterCard or American Express). Can I Tip the Fantastic Party Staff? Your Party Leader welcomes all tips.